….flew across the room when I flicked on the light switch in my studio. The lightbulb had exploded. I sighed and went to the kitchen for a dustpan and brush. Thankfully no glass had become precariously lodged in the ceiling. Those days were long gone. Or were they? Were these frequent near death experiences related to a bygone era? A long-lost plot? An unfinished paragraph that I had begun in 2006? I gazed into the middle distance and looked thoughtful. Some hours later, after I had finished thinking and looking pretty at the same time, I ascended the stairs to my purpose-built garret at the bottom of the garden. They were still there where I had left them some years previously – a large cardboard box, and an old thick notebook stuffed with diagrams, maps, menus and all manner of paper ephemera. There was nothing more in the garret other than these items. I lifted the flaps on the box, faded, dry, and dusty, and counted the bottles within, there were two missing, which was no surprise. I pulled out the smallest, the first one I’d made. 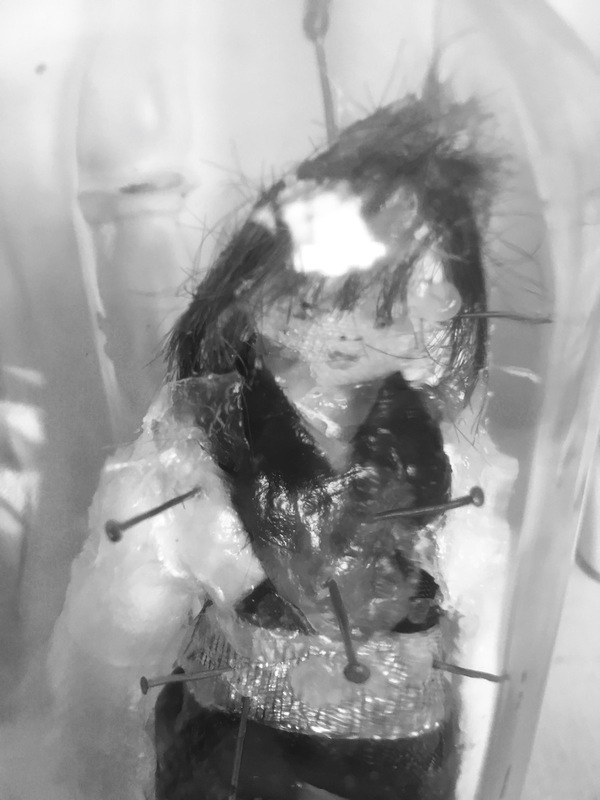 It contained a wax effigy pierced with pins. I rolled my eyes, how stupid of me to make the effigy using my own hair and clothes. No wonder I have tinnitus…. It seems I had unwittingly cursed myself with misfortune. Thankfully during my long spell of thinking I had had a couple of interesting thoughts. Perhaps all was not lost. Perhaps I was taking these explosive mishaps a little too literally? Perhaps the mishaps were merely signs? Signs to tell me that I was on the wrong track; signs telling me to return to where it all began. 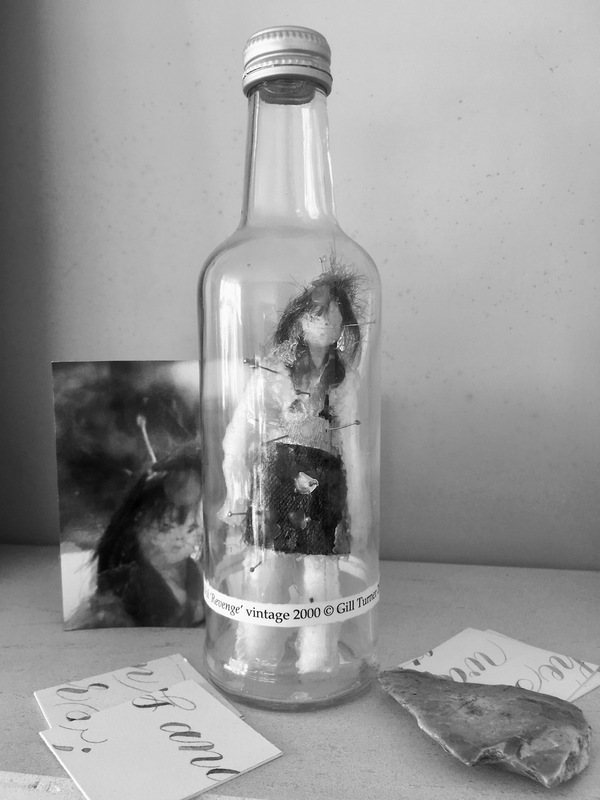 This entry was posted in Bottled and tagged bottled art, bottled feeling, bottled revenge, picking up threads on January 9, 2019 by Scarlet. Bad juju! Good thing you didn’t stab the Miss Scarlet effigy with that large arrowhead! I am impressed, Mr Lax, that is indeed an ancient arrowhead! I keep it with me always for when I gaze into the middle ages. Savvy – Thank you for the information! I was going to suggest that Mr Devine could double as a High Priestess, but reading on it seems that his services will not be required after all…. I just need to get very drunk on Sazerac? Which sounds like an excellent plan! I shall do this at midnight under the next full moon, and I will do it cross-legged with a scented candle beside me. I shall report back when it is done. Jon – I think the Sazarac recipe could knock me out until 2020! Just as well that Savvy has a solution, as my High Priestess frock is at the cleaners, and I’m not doing it in the altogether as it’s too bloody cold! Mr Devine – If all this nonsense is still going on in Summer you may have to get your kit off. Oh dear. A case of voodoo it yourself, eh? Or to yourself, rather. Well, it’s a bit embarrassing no doubt, but I’d say your best bet would be to take yourself down to the hexes and curses clinic and get it looked at. They’ll probably have seen it all before and prescribe a white cockerel and a course of John the Conqueror root, or perhaps a jab. Mr Batarde – Voodoo it yourself!!!! Ho Ho Ho!! [apologies, I am still in Christmas mode] I like it! Although I am not liking it’s far reaching effect. 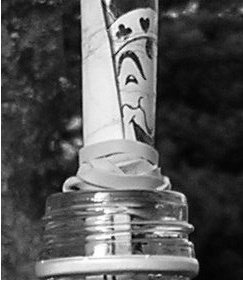 Perhaps a white feather from the cockerel dropped into the bottle would salve the wounds? Or would that just make me sneeze a lot? Chucking in a few chips of John Conquerer root seems seems like the best option! I will do that soon as! Th little doll is rather giving me the willies. Mistress Maddie – I apologise! It’s honestly the most hideous object I have ever made – but I kind of love it as well! Mr Mags – I know!!! In a related situation, I am struggling with making Vudu work with my iPod! I think you have to do the Hulu backwards first. ….whilst wearing a grass skirt? Stick a pin in it and shake it? But I think you are on the right trail…just need to lay out the correct sigils in the correct sequence, step thrice backwards, turn once to your left, then once to your right, and wish for the man of your dreams tonight. Also, invoking the aid of the Daddy-O, Baby-O and Perforated Spook. may help.But only if you speak it in Latin. Oh! Don’t let Sid get glass splinters! Dinah – I think taking up drink in 2019 is the way forward…. or would be if it didn’t make me sleep really badly. I was very grateful that Sid wasn’t in the room when the lightbulb exploded! Dust pan and brush followed by a good vacuum clean. That doll is pretty freaky. But I find all dolls a bit scary, especially Barbie & Ken. If it makes you feel any better, a light bulb exploded in my office just before Christmas. I’ve been finding shards of glass ever since. And I don’t have a wax effigy of myself. Joey – Apologies for the doll!! I’m sort of pleased that I’m not the only one with exploding lightbulb issues! Those little shards of glass are lethal. I’ve also had an exploding battery in a smoke alarm [oh the irony], which sounded like someone had broken in to my home and was making merry with a shotgun. Dinah – I was always fond of Barbie. My mum used to knit dresses for her. My Barbie was always well covered…. and then I cut all her hair off….the poor doll saw none of the glamour that Mattel created for her. Have you lost your mind for the new year? Who makes a voodoo doll of one’s self?! It’s a death trap, it’s a suicide rap. Even if it’s all baloney, why play with fire? I don’t have a superstitious bone in my body but I *never* walk under a ladder. And strolling around Manhattan it comes up more frequently than you’d think. There’s *constant* construction. You have to be careful. REVERSE THE CURSE. I see Savvy had the cure up above. Monsieur Pain – Not walking under a ladder is good sense! I recall that London is mostly a construction site. These big cities – will they ever be finished? You are right, I was dabbling with things I didn’t fully understand. Let’s hope Savvy’s method works! This would make a very interesting story for Take A Break magazine they will pay £2000 for it! Ha Ha Ha!!!! You could be onto something. Would they come and interview me properly? Would they take photographs of me looking horrified whilst pointing at the light-fitting, and then the doll? I could do with £2,000. I’m subscribing to Take A Break in the hopes that you’ll take Mitzi’s advice. They will probably use your photos if they’re good enough and contact you just to confirm you are who you say you are, send one of yourself sitting on the very edge of a chair, shoulders hunched, clutching the doll and looking up at the light fitting showing the whites of your eyes, think Sissy Spacek in Carrie and a close up one of the doll alone. It would make an excellent piece in their Halloween edition you might even make it on This Morning with Phil and Holly. Will you be my agent? We could go halves? Mr Swings – I shall ask Mitzi if Take A Break will be interested in the film rights. Lulu – Blimey, this exploding glass thing is doing the rounds like a nasty virus! An effigy made with your own flotsam and jetsam? What on Earth were you thinking?!? I suppose it’s a good job that you imprisoned it within one of your witchy bottles. You know, I stopped watching Chilling Adventures of Sabrina because of something like this. In one of the early episodes, the antagonist insinuated her way into the Spellman mortuary and found a pot full of nail clippings from Hilda from or Zelda, which took me right out of the story, as what self respecting witch would keep bits of herself lying round for anyone to get hold of? Ridiculous. In a word, Antony Hopkins, Magic. Being on the wrong track is my signature talent so the whole post had a familiar ring to it it, apart from the fact that I don’t have the talent to make a doll that looks like myself or anything else !! The internet is a wonder. How else could I read the latest post by the Duchess of Penshire and learn of her exploding bulb and bad voodoo doll (no such thing as a nice voodoo doll)? But that’s not all. Next I read of the brilliant solution offered by the savvy Lady of Savannah. Now I have a cocktail to research. With just a click and hold, I’m scrolling through a Wikipedia page about Sazerac where I learn the drink was part of James Bond movie script. All of this brighten the dull bulb in my head. Now is it shaken or stirred? Ha, don’t buy those cut-price Eastern European bulbs, I had one explode a couple of years back. Luckily there were no injuries. Clearly I’m missing out on the wax effigy experience. I must produce an appropriate pin-riddled self-effigy and stuff it in a bottle right away. Or perhaps a wax effigy of some deranged politician would be more useful (plenty to choose from).